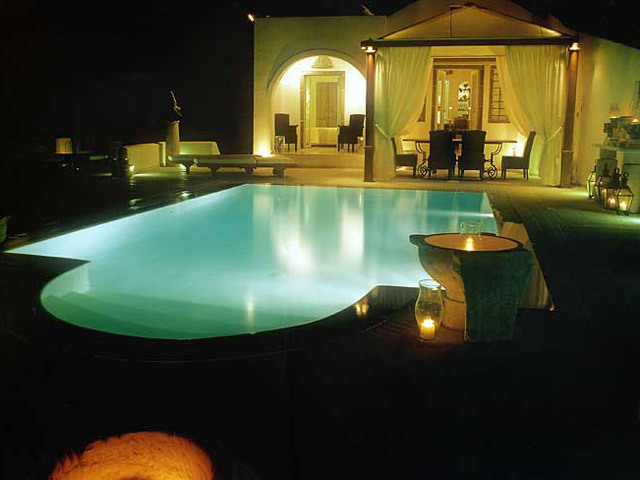 The Santorini hotel of your choice in Imerovigli, on the island of Santorini. 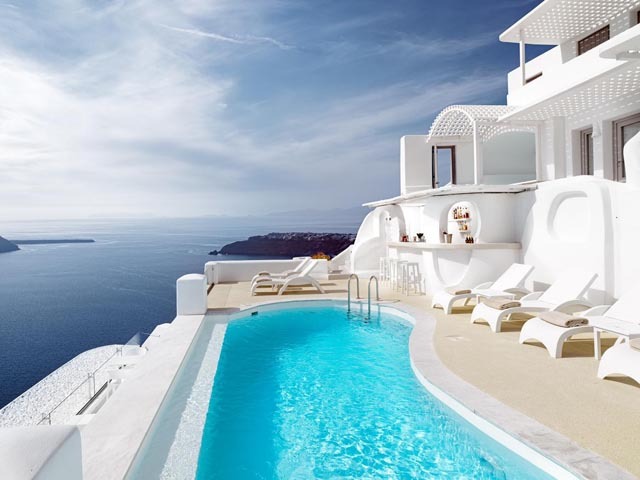 Much beloved and world-famous, the island of Santorini in Greece is a place of awesome beauty and bewitching atmosphere. Its exceptional character is a blend of blazing volcanic rock, against the backdrop of the deep cobalt-blue sea and the clear Aegean sky. The imposing Caldera is the result of the volcano’s biblical eruption, a crescent of cliffs rising steeply hundreds of meters above the water, with white villages nestled upon their tops. One of these picturesque settlements is Imerovigli, a small distance away from the capital of Santorini, Fira, where you can find Tholos Luxury Hotel Resort. Perched on the cliff of the Caldera, the hotel will offer you an accommodation of luxury and hospitality, in a magnificent setting overlooking the volcano. Panoramic vistas to the crater, submerged into the deepest blue waters, sparkling under the bright sunlight, will leave you enchanted in the day, while the spectacular sunsets that turn the landscape into a mélange of dreamy pictures will make your memories unforgettable. The whitewashed apartments and studios, all in the traditional Cycladic style, are built on different levels of the cliff, with terraces or balconies facing the superb surroundings. In their discreetly luxurious interiors you’ll find comfort and relaxation. At the patio by the outdoor pool on the other hand, you’ll enjoy refreshing moments under the sun or romantic time under the stars. The service, day and night, is friendly and impeccable, while the hotel’s owners are always at your disposal for your every need while staying here. On the much beloved and world-famous island of Santorini , a small distance from the capital, lies the picturesque settlement of Imerovigli, perched on the cliff of the Caldera. 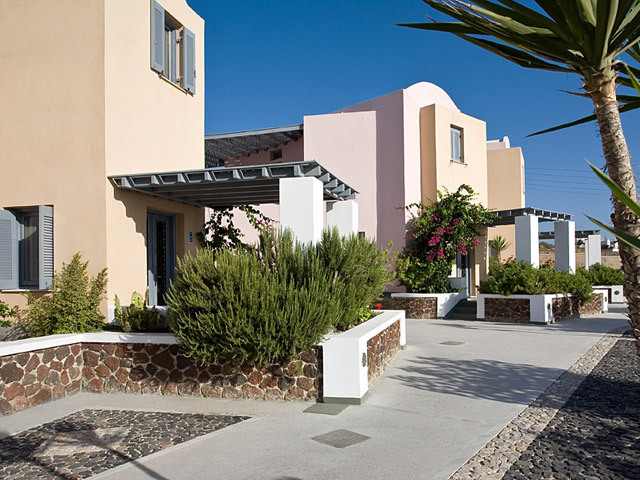 Here you can find Tholos Resort that will offer you an accommodation of luxury and hospitality. Our Standard Suite totally renovated for the Season 2017 provides a private balcony with a seating area overlooking the famous Volcano and the Endless Blue Aegean Sea, a double bed equipped with eco-friendly Coco-Mat mattress, a seating area and a bathroom with shower. A unique Suite totally renovated for the Season 2017 provides a private balcony with a seating area overlooking the famous Volcano and the Endless Blue Aegean Sea, an interior modern Jacuzzi with astonishing panoramic caldera view, a King size double bed with eco-friendly Coco-Mat mattress and a bathroom with shower. Our Superior Suite totally renovated for the Season 2017 provides a private balcony with a seating area overlooking the famous Volcano and the Endless Blue Aegean Sea, a King size double bed with eco-friendly Coco-Mat mattress, a spacious comfortable seating area with a built in sofa bed and a bathroom with bathtub with hydro massage or shower. Our Suite totally renovated for the Season 2017 provides a private balcony with a seating area overlooking the famous Volcano and the Endless Blue Aegean Sea, a King size double bed with eco-friendly Coco-Mat mattress, a spacious comfortable seating area with a built in sofa bed and a bathroom with bathtub with hydro massage. Our unique Suite totally renovated for the Season 2017 provides a private balcony with a seating area overlooking the famous Volcano and the Endless Blue Aegean Sea, a bedroom featuring a King size double bed with eco-friendly Coco-Mat mattress, a second bedroom which also can be used as a living room with a double bed with eco-friendly Coco-Mat mattress and a built in sofa, two bathrooms with showers. Our Deluxe Suite totally renovated for the Season 2017 provides a private balcony with a seating area overlooking the famous Volcano and the Endless Blue Aegean Sea, two bedrooms featuring a king size double bed with eco-friendly Coco-Mat mattress and a double bed, a separate living room with a built in sofa bed, two bathrooms with showers. Our Tholos Honeymoon Suite totally renovated for the Season 2017 provides a spacious balcony with a seating area overlooking the famous Volcano and the Endless Blue Aegean Sea, a large bedroom featuring a double King Size bed with eco-friendly Coco-Mat mattress, a spacious comfortable seating area with two built in sofa beds and a big bathroom with Jacuzzi bathtub. Tholos Villa fully renovated for the season 2017 provides a completely private spacious balcony with a sitting area. 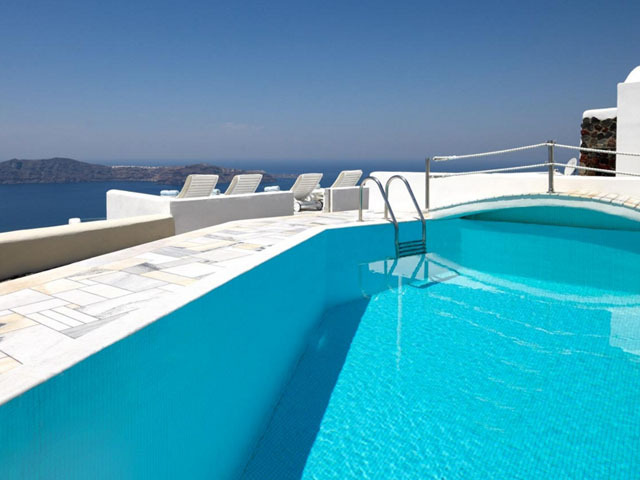 A Private Outdoor Jacuzzi overlooking famous Volcano and the Endless blue Aegean Sea features a cave with Interior Pool and a Jacuzzi to spoil you the most on our gem property. While on holiday, there’s nothing like a lovely dinner to top a long warm day spent at the beach or around the island’s numerous attractions. On the patio of our hotel, with swoon-worthy panoramic vistas, your dining will become a true feast of the senses: as the spectacular sunset slowly brings the romantic evening, you will indulge in a fine gastronomic experience and enjoy inspired plates from our menu with emphasis on the modern Mediterranean cuisine. And, if you wish to add even more to the stunning scenery and culinary delight, you can choose to have a private dinner with your darling, family or friends in a special corner we have created, in order to offer our guests a unique feeling of intimacy and seclusion. It’s the kind of personal touches that matter to us because they’ll make your memories everlasting.